Quite by accident I stumbled upon the work of Gerard ter Borch, and I was captivated by his unique and innovative style. It is perhaps one of the greatest injustices in the history of art that Gerard ter Borch has been a largely overlooked Baroque Master of the Dutch Golden Age. It’s high time that Gerard ter Borch is awarded the widespread credit he deserves, not just from a select group of specialists and connoisseurs. In my humble opinion he deserves some of the adulation that continues to be heaped on his more famous, younger contemporary, Johannes Vermeer. Painted when ter Borch was 47 years old, this oil on canvas masterpiece is now housed in the Rijksmusem in Amsterdam and measures 71 x 73 cm. It also challenges one’s perceptions with its psychological complexity. It is inherently ambiguous. The first thing my eyes are drawn to is the woman’s sumptuous, silvery satin garment; the incandescent heart of the painting that radiates onto our retinas. The folds, creases and shadows on the long skirt are so exquisitely rendered, I want to stretch my hand out and stroke the silky material between my thumb and fingers. It is sensual and utterly sublime. The shine, shade and texture of her dress takes my breath away. It looks so real I expect to hear a faint rustle as she moves or walks. The way the light reflects on the satin fabric contrasts dramatically with the black velvet covering on her upper back and shoulders and lace back, as well as the more muted colours of the other two people and the dark background, forcing your gaze onto the transaction between the three protagonists. In this way Ter Borch directs our attention to the inner lives of the subjects in their home or another everyday environment. Ter Borch displayed an admirable ability to capture private scenes of human drama – men and ‘juffertjes’ (young ladies), in their beautiful gowns, captured in typical 17th century bourgeois settings. The subjects of his genre paintings are usually involved in various activities, such as singing or making music, reading or writing letters, or hinting at more intimate pastimes, (as is the case with The Gallant Conversation). Because The Gallant Conversation is painted with such subtlety, and the setting is so cleverly nuanced, it encourages the audience to speculate as to its true subject. It is believed by Ter Borch’s biographer and other scholars to actually depict an amatory negotiation between a soldier, a prostitute and her procuress inside a brothel. Probably the large, reddish wooden bed behind the figures is a bit of a giveaway, as well as the objects of feminine beauty on the table to the left of the woman; especially the rather elaborate mirror and the trailing pale ribbon. I love the way the silver bowl and candle holder glint in the parsimonious light of the foreground. It is as if Ter Borch is being not only a skillful, but also a rather gallant painter, protecting the woman’s honour by deliberately not showing us her face. Instead he has shielded her identity and hints at her beauty and profession by the splendour of her clothing, her translucent neck, and carefully arranged hair. The military officer is addressing the courtesan, and the older lady seated next to him appears to be contemplating his words as she sips her wine. Could there have been a coin held in his raised right hand? Although his uniform is not as dazzling as the woman’s sleeves and skirt it still impressive: the flecks of gold in his ribbed sleeve, the degrees of gold shading of his tunic and the material tassels hanging from his outer trouser, the yellow and blue plumage in his hat that rests on his right knee; down to the detail of the nails on the sole of his right boot placed nonchalantly across his left knee. His sheathed sword is still attached to his belt. To me his facial expression is rather enigmatic, but perhaps hints at his desire with a self-assured countenance. The red velvet chair he is sitting also elevates his importance as a customer. The expression of the mangy cur behind him is pitiful, his dark eyes pining for affection and food. The dark clothes of the madame and her less prominent facial features and the surrounding sparsely furnished room is of less importance than the young man and woman. The scene, though tastefully done, is reminiscent of the somewhat tawdry task of agreeing and conducting the business end of a supposedly loving, passionate and physical deed. Ter Borch has shown sensitivity to a ‘transaction’ preceding a sexual act, and leaves you to imagine the old woman placing her glass on the red tablecloth having agreed the price, and silently leaving the room. The idea that the couple could have been the young woman’s parents originated with Goethe, after he viewed a copy of the painting by the artist on display in Berlin. But to my eye the male figure is clearly too young to be her father. In his “Die Wahlverwandtschaften” Goethe notes the delicacy of attitude of the figures. He remarks how the father quietly and moderately admonishes his daughter who is seen from behind. The woman next to him Goethe interprets as the young woman’s mother, who lowers her eyes so as not to be too attentive to the ‘father’s admonition’. This moralising title, however, is without foundation and does not conform with Ter Borch’s usual themes. That Goethe’s interpretation was possible at all shows the refinement of Ter Borch’s treatment. Even if he made a mistake, Goethe had the right feeling for the way Ter Borch treated his subjects. In the Berlin painting the coin had been rubbed away, perhaps to erase its offending implication? 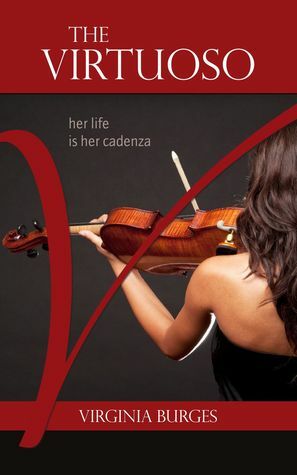 Psychologically and pictorially he retains a masterful touch and delicacy. It is most likely Ter Borch’s beautiful half-sister Gesina, who is posing as the woman in many of his works. He sketched and painted her extensively in the late 1640s and early 1650s. 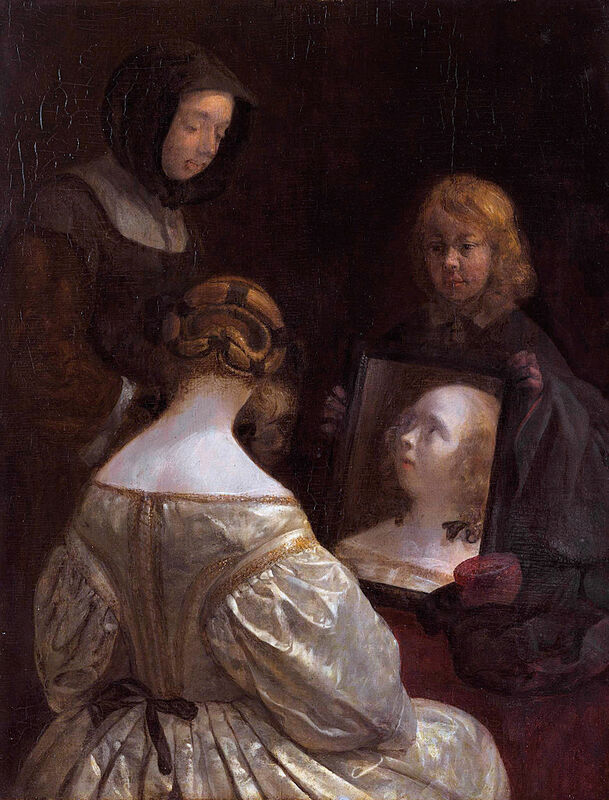 Perhaps his most innovative and stunning painting of her is Woman at a Mirror (c.1650). 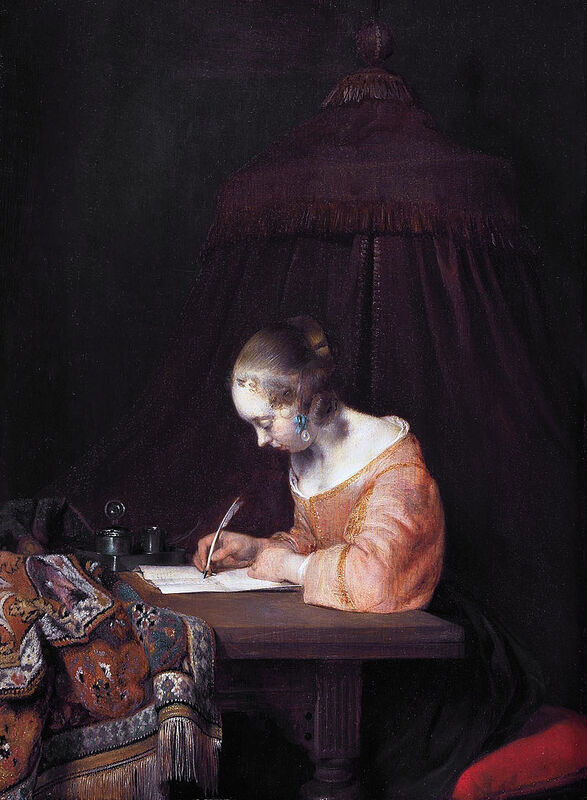 It also contains the two elements of Ter Borch’s typical modus operandi: a beautiful young lady, brightly lit against a dark background, predominantly seen from behind wearing lush, satin garments. 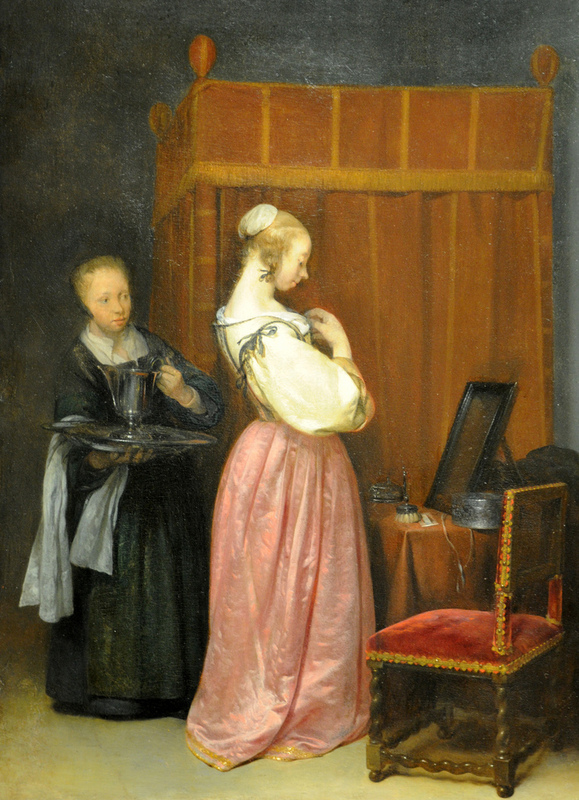 Gesina is also featured in full-length panel, A Young Woman at Her Toilet with a Maid (c. 1650), at home these days in the Metropolitan Museum of Art in New York. Perhaps if the Gallant Conversation were painted today it would be titled: Indecent Proposal! 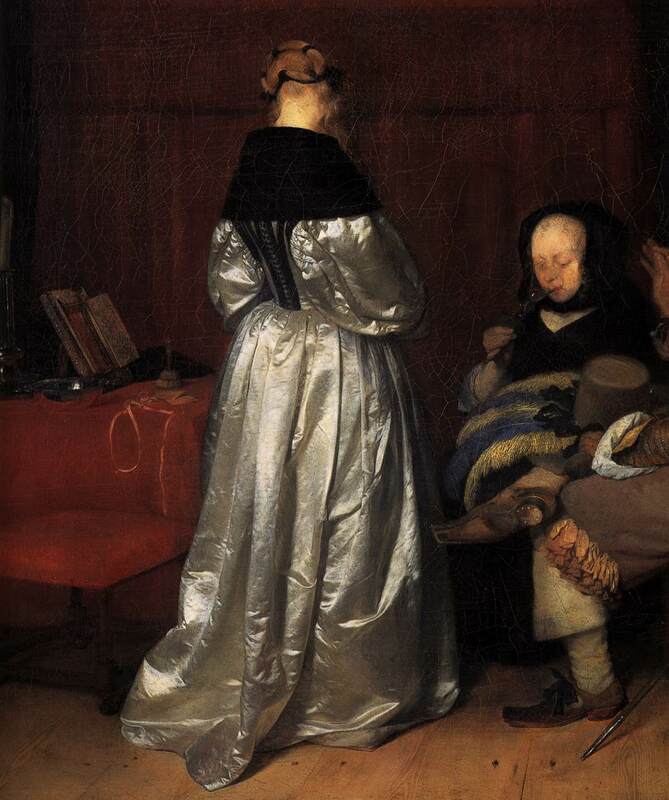 Ter Borch’s skill in creating an image so compelling and yet so ordinary blows me away. He manages to elevate a scene essentially considered carnal in nature: prurient and potentially crude, and elevates it to a work of art, to something that could be hung in front of visitors and relatives in civilised circles. 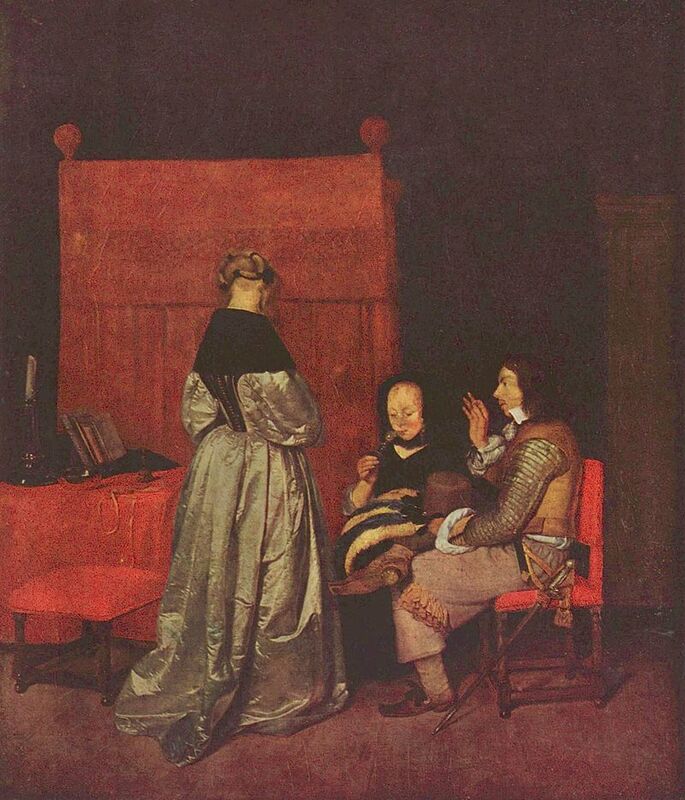 Gerard ter Borch made numerous copies of The Gallant Conversation, each similar yet a little different. Aside from Ter Borch’s own copies, it is the most widely copied work by a Dutch artist, with some 24 copies said to have been created by various artists. If imitation is a compliment then the work certainly drew many admirers! Gerard ter Borch the Younger was born in Zwolle, son of a successful painter, Gerard ter Borch the Elder, who naturally taught Gerard junior the rudimentary skills of his trade. A precocious talent, his father had proudly kept an early sketch of horseman drawn by his son at the tender age of seven. In 1635, barely eighteen, ter Borch went to England where he worked in his uncle’s London studio. Artistic talent ran in his family; his uncle, Robert van Voerst, was then the royal engraver to King Charles I. 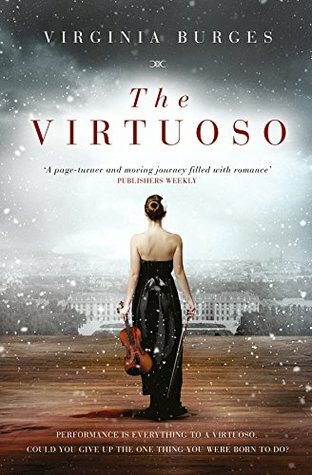 It seems his father knew what would be in vogue in the baroque European courts. In his lifetime Gerard ter Borch II became one of the most renowned artists of the Dutch Golden Age. Ter Borch’s oeuvre consists mainly of portraits and genre paintings. In 1640 Ter Borch travelled south and spent time in Rome, and from 1646 he lived for a few years in Münster, Westphalia during the peace congress. 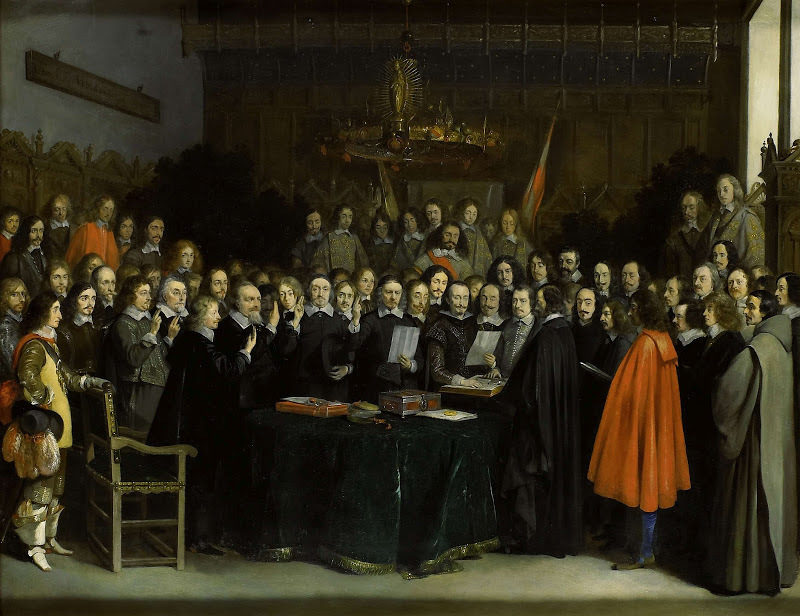 His masterpiece from this event, completed in 1648, was The Swearing of the Oath of Ratification of the Treaty of Münster, (in the National Gallery in London), portrays the delegates of Holland and of Spain assembled to sign the peace treaty. He was moving in powerful, influential circles by the time he reached his early thirties; his artistic services were in demand by the aristocratic elite of Amsterdam, and commissions came from nobles and monarchs across Europe – including William of Orange and Cosimo III de’Medici. 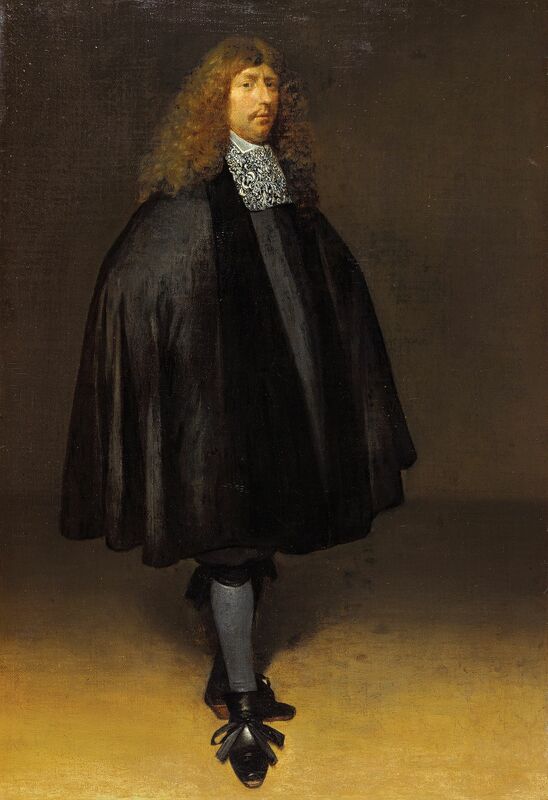 By 1650 he was paining in Madrid, where it was rumoured he painted a portrait of King Philip IV. An astonishing achievement if it happened – an unknown young Dutchman making a portrait of a Spanish monarch. In 1655, rather than setting up his studio in the bustling cities of Amsterdam and Delft, Ter Borch finally chose to settle in Deventer, and married his step-mother’s sister. In his earlier years he painted many guardroom subjects in the manner of Pieter Codde and Willem Duyster, but later, from about the time when he eventually made a home in Holland, he painted stunningly drawn small groups, posed easily and naturally against shadowy backgrounds and imbued them with an almost aristocratic elegance that was unique among Dutch painters of his time. 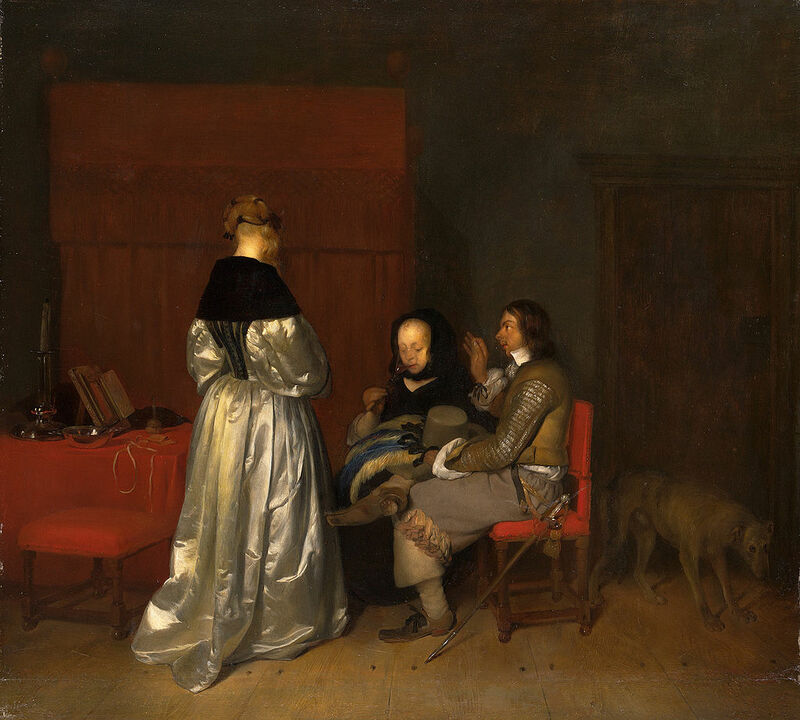 Gerard ter Borch was creative and avant garde in his concepts, he invented the style of pictures that Joahannes Vermeer successfully developed with his own ‘lighter’ style that remains popular today. Contrary to Vermeer’s paintings, the dim light and the subdued chiaroscuro of Ter Borch do not allow a complete grasp of the whole field of vision. The light comes mostly from the front and stops at the glossy surfaces of the costumes and other textures. 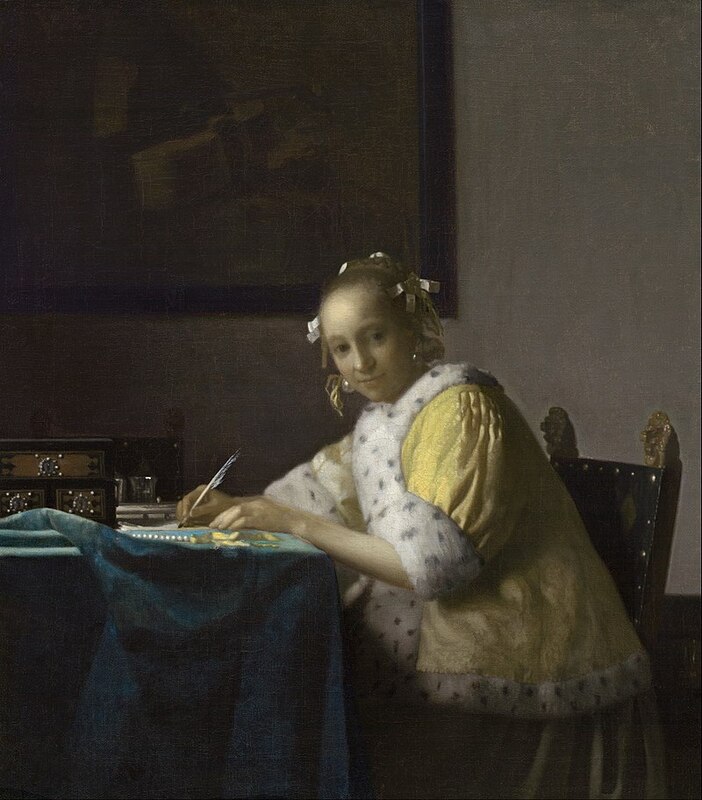 Art historians have discovered compositional sources for almost all Vermeer’s works. It seems he kept an eye on what his peers were producing, and borrowed subjects and poses from the artists he admired and respected. In that way he can be compared to Shakespeare, who built on existing literary subjects with his own brand of genius. 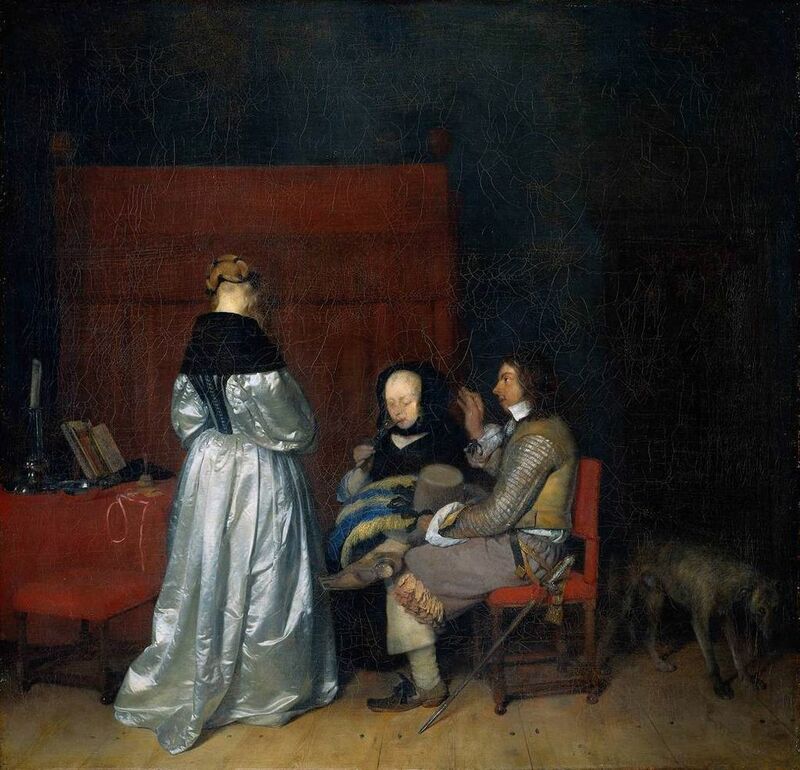 Despite his lack of universal appeal, Waiboer asserts that should a good genre painting by Ter Borch come onto the market, it would fetch around £4.5 million. 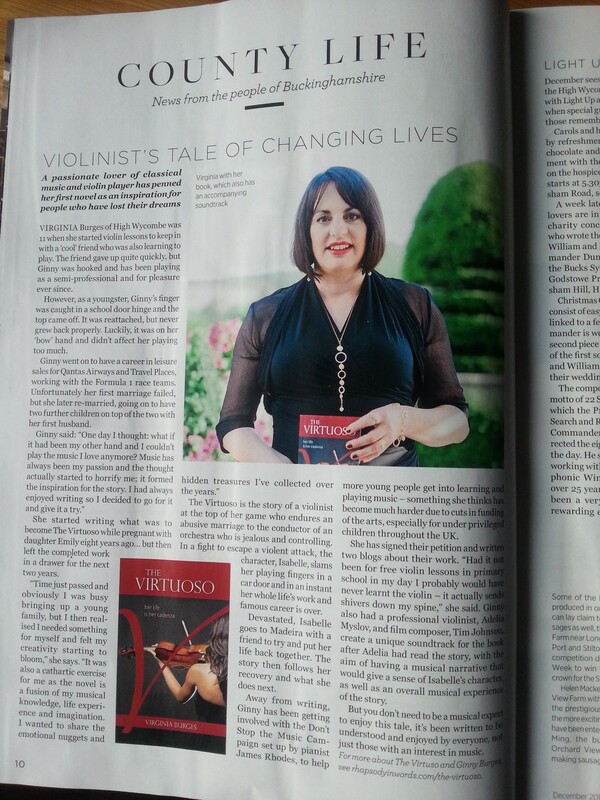 Not bad for a country bumpkin!